Larry Spencer and Gayle Sheets will lead the Instant Musician Workshop on Saturday at 2 PM. All instruments and people are welcome. There will be a variety of rhythm instruments available. 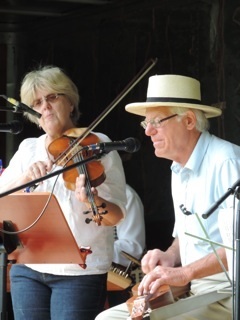 Larry and Gayle will be playing some of their favorite tunes in the key of D (dulcimer friendly). If you know the D, G and A chord, you will be an instant success! Come and warm up with some good old familiar tunes and begin the weekend by playing and singing your heart out! Song sheets with verses and chord changes will be provided. Hear more of what they play at Picks & Hammers String Band!